Veteran yachtsman Tony Bullimore has belatedly set sail on a new solo round-the-world record attempt. The Bristol-based mariner is aiming to beat Dame Ellen MacArthur's record of 71 days, 14 hours and 18 minutes, which she set in 2005. The 67-year-old had planned to start the 27,000-mile journey over Christmas, but was delayed by bad weather and last-minute repairs. He set off from the race start point at Hobart, Tasmania, on Tuesday. Bullimore's preparations for the challenge have been marred by a number of mishaps. Fears grew for his safety after he failed to make contact for 10 days when his communications went down as he sailed across the Indian Ocean to the challenge start point in Australia. Then on arrival in Western Australia his giant catamaran, Doha, crashed into a jetty, sending one of his crew hurtling into the sea. Despite the hitches he said he was confident of breaking Dame Ellen's record. "It's a very, very difficult record, my boat is quite an old boat now, it's 23 years old, although it has today's technology as everything has been changed on it," he said. "It's a tough record, if you get the boat right and I'm right and we get the right weather conditions, which is absolutely paramount, then I've got a good chance of breaking the record." Bullimore is perhaps best remembered for capsizing in the Southern Ocean in 1997 during the Vendee Globe solo non-stop race. He spent five days in the upturned hull of his yacht, surviving on "a little chocolate, water and sheer determination" before being rescued by Australian Air Force and Navy. 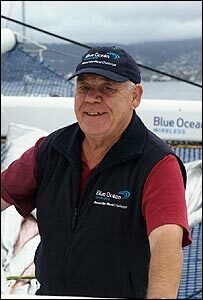 The Blue Ocean Wireless Round the World Challenge takes Bullimore back to the Southern Ocean, where the westerly winds in the Roaring Forty latitudes will push him across the first 5,000-mile stage to Cape Horn. He will then follow the South American coast northwards to the Equator. From there he must pick his way through the calms of the Doldrums to round the island of Flores before returning southwards to the Cape of Good Hope.